So the new wheels are sweet. An updated version of what I was driving. So, I’m enjoying the new car smell. And the best part, is that I feel totally bad when I start the car, because my new key/clicker is combined, and flips out like a switch blade. So it feels like I’m jacking my own car every time I get behind the wheel. I hate this feeling. I went to lease a new car, and found out my credit score went down, thanks to a stupid fiasco with my student loan. As much as I want to play it off like it wasn’t my fault, I was busy and got lazy and let the thing lapse for a while. Now my new car lease costs $85 more than the last one. And it’s demoralizing. The main reason I’m ticked at myself isn’t the money. I can make that work. It’s more that I think I felt “embarrassment.” Like, an irrational need to explain what happened. I had told those people that I wanted a car from them, and I had what I was willing to pay, and I wasn’t going to accept something on their terms and that I was doing them a favor by giving them my business again. I said I respected them because they treated me like a human being and I walked out of multiple car places because they were a-hole sales people, and that’s not how I operated. I got them down $30 a month from their initial terms. And then their finance guy drops the credit score on me. And it was slightly embarrassing. I think. I feel embarrassed about something so infrequently that I’m not exactly sure when I am feeling it, or even if I have at all (or even how to spell it, thanks spell-check!). I’ve always felt like I was above embarrassment. To me, I think embarrassment is kind of weakness. As I understand it, when you do something “embarrassing,” you basically feel shame or want to hide from it. That’s not me at all. I hate this feeling, mostly because it’s frustration at myself for being stupid (like when you lock yourself out of your house, for example). This one is really tough, because it’s actually affecting me. Most things, like, saying something stupid when I’ve been drinking, for example, I just shrug and say “yeah, so what?” but the “so what?” to this one is “Enjoy your higher car payments.” And I have no one to blame but me. Its tougher to own, because I’m driving the exact same car as before, but paying way more for it. And I don’t know if I’m going to think about it every single time I get into the stupid thing. So yeah, I screwed up. And this is my price to pay. Screw it. I can afford it. I’m now going to be cognicent of my credit score, and do my best to absolutely dominate my finances in the next 36 months. What else can I do besides that, and crank my stereo in my sweet new car? When your friend is having relationship drama, it’s incredibly easy to see, identify and offer advice. But the fundamental truth is that even when that person hears you, agrees with you, and plans to follow your advice… they completely change their tune when they’re alone with the person they have drama with. That’s because for you, the signs are obvious. There’s clearly something wrong. To them, a change that resulted in the current dramatic conditions were so gradual, the current conditions merely became normal. And people fear change. It’s easier to deal with the same stuff you’ve been dealing with than instigate change. What seems like chaos and drama to you is actually a comfort zone for them. Even though it’s blatantly obvious to those around you that you shouldn’t be comfortable in that situation. So they deal with it. It’s amazing I never reached this conclusion before. But the big question is, the next time I have drama, am I going to remember this? There are nights when insane fun happens and there are nights when friends hang out and funny things are said. The latter happened last night (when I meant to hang out for an hour and a have and then go home, watch the Mets game and pack for an upcoming move). And then there are nights with deep meaningful conversations. As fun as the funny things are to recap, it was a much better experience Wednesday because of the deep meaningful conversation. When I was in Dayton, it was a town where not much was going on. But what made it memorable for me, was that I had deep friendships with the people I hung out with. Tonight was really my first experience in New Orleans with the same type of thing. (Actually, it makes sense. It took about the same length of time from my arrival before my friendships in Dayton cemented themselves and we had those kinds of nights). In a place where there an infinite amount of optipns for drunken shenanigans, it was way more enjoyable to have the kind of conversation I once had on the trunk of my car in a bowling alley parking lot in Dayton, Ohio. The type where people’s problems are discussed and (while usually not coming to fruition), eventually solved. And we did discussed and solved. Not sure if any of it helped: people can always see other people’s problems better than their own; and the last two people out chatting where the two with the least amount of drama in their lives (at least on this night). But in the end, what matters is not the jokes, the laughs, the drinks or the problems. It’s that you have people you can bring your problems to. Me: Hi, my DVR records things with pixelated stutters. Why is that? Why can’t you provide me with a service that works? CSR: Well, it only does that when there’s a lot of sudden pixel changes. That will happen sometimes. Are you trying to watch a program with fast movement? Me: I’m trying to watch a freaking race. It’s all fast movement. Phillies broadcaster Harry Kalas died this week. And while you’re probably expecting some joke because I hate the Phillies, I am way classier than that. Here’s my question though. When a guy associated with a team for 30 years passes, everyone from the organization is going to go to the memorial service, right? Well what about the mascot, the Philly Phanatic? I think he should go. #1 – He’s one of the symbols of the franchise. His paying respects is a symbolic gesture. #2 – Unlike a lot of mascots, the Philly Phanatic’s expression isn’t a broad smile, which would be slightly inappropriate for a funeral. However, not mine. I’d love to have a mascot, or several, at my funeral. That’s be awesome. I’ m sure there would be children at my funeral. And I don’t want them sad. So the mascots could cheer them up. The Hawk would be awesome because he’d have to flap his arms the whole time. High comedy. Now that would be high comedy. Also, can someone get this guy a name? 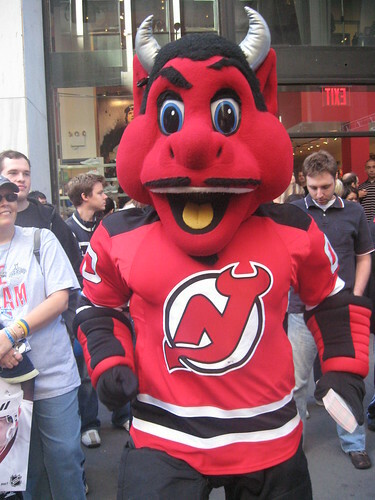 His name is New Jersey Devil. I’m sure there’s more awesome mascots who could come to my funeral. Since I hate the Phillies, maybe the Phanatic could dance on my grave. One of my friends recently confessed to me that she had signed up for match.com. I pass no judgement. But it got me thinking… I wonder what it would say about my compatibility with random people I know? Like, out of my friends, which ones would I be most compatible with? I don’t have any friends that I want to date, but maybe seeing the results would make me re-think that. Or more likely point out how really superficial I am. Ok, maybe this is not a good idea. But I’m definitely curious. Or it could show me who’d make a good roommate. Hmmm, what would I need match.com for? I have a website. I could just put up an application to date me on it. You are currently browsing the Kev-Fu blog archives for April, 2009.